Or more like a cover feature since I'm a little late on the reveal. 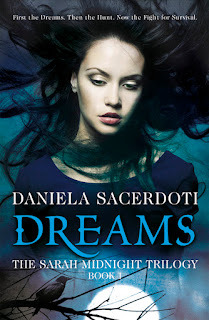 Dreams (Sarah Midnight Trilogy, Book One) by Daniela Sacerdoti. Publication Date : 17th Date by Black and White Publishing. Audience & Genre : Young Adult, Paranormal. You’d never think it could happen to you. You’d never think that one day you’ll stand in a graveyard, rain tapping on a sea of black umbrellas, watching your parents being lowered into the earth, never to come back. It’s happening to me. They said it was an accident. Only I know the truth. My parents were hunt- ers, like their parents and grandparents before them, hundreds of years back, scores of ancestors behind me, fulfilling the same call. I must fol- low in their footsteps. I am the only one left to keep the promise. Ever since her thirteenth birthday, seventeen-year-old Sarah Midnight’s dreams have been plagued by demons – but unlike most people’s nightmares, Sarah’s come true. Her dreams guide her parents’ hunt as Sarah remains in bed, terrified but safe, sheltered from the true horrors of the Midnight legacy. But all this is about to change. After the murder of her parents, she is cruelly thrust into a secret world of unimaginable danger as she is forced to take up their mission. Alone and unprepared for the fight that lies before her, Sarah must learn how to use the powers she’s inherited and decide whom to trust before it’s too late . . .
Daniela Sacerdoti was born and raised in Italy but has lived in Scotland for the past ten years. She holds a degree in Classics from the University of Turin and has taught Italian, Latin and Greek. Writing has always been a big part of her life – her great-uncle was the renowned Italian writer Carlo Levi. Her first novel Watch Over Me was published in November 2011. She lives in Glasgow. I just added this to my TBR list! Thanks for bringing her to my attention!